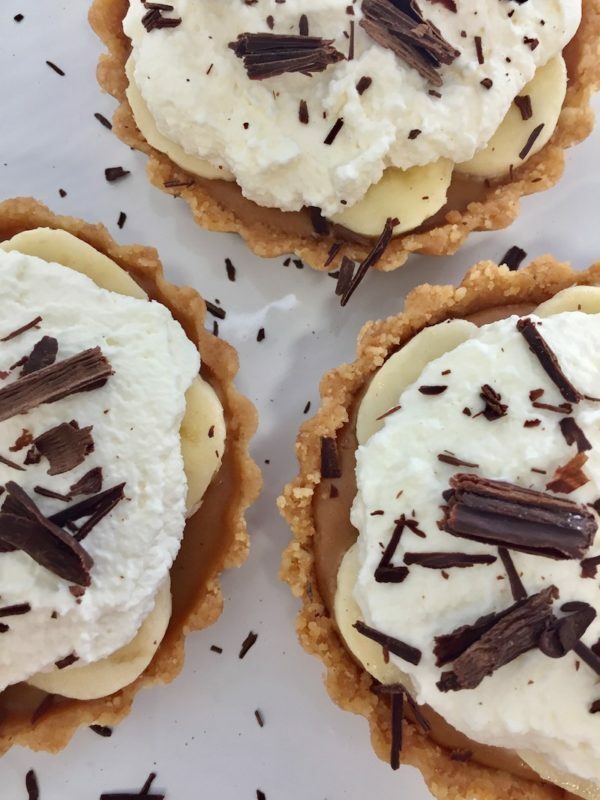 Banoffee Pie is what we have called the crown jewel of desserts. This time, we’re adding a splash of Bailey’s to truly make this an over the top dessert. Yields 1 6” pie, serves 6. 3) Mix in Baileys Irish Cream Liqueur while whipping cream to heavy peaks (set aside 8 oz of cream for top decoration). Add 4 oz of the whipped cream into the caramel and whisk until fully incorporated but do not over stir. Pour caramel mixture onto piecrust and spread until smooth. 4) Refrigerate for at least 4 hours or freeze for 1 hour. 5) Chop banana and place evenly over the caramel layer. 6) Finish with whipped cream over the bananas and top with grated chocolate. Leave to set for another 30 minutes in the refrigerator before serving. Serve with tea, coffee or Bailey’s on ice. You can also use 3 small tartlet moulds for this recipe as indicated in the photo. This entry was posted in Blog and tagged Bailey's, Banoffee, cream, pie, recipes, St. Patrick's Day.